Gabe Venturelli making it look easy. Good to see a friend, a Santa Barbara local, getting it like not many people do. In the middle of summer, no less. Pacific love. 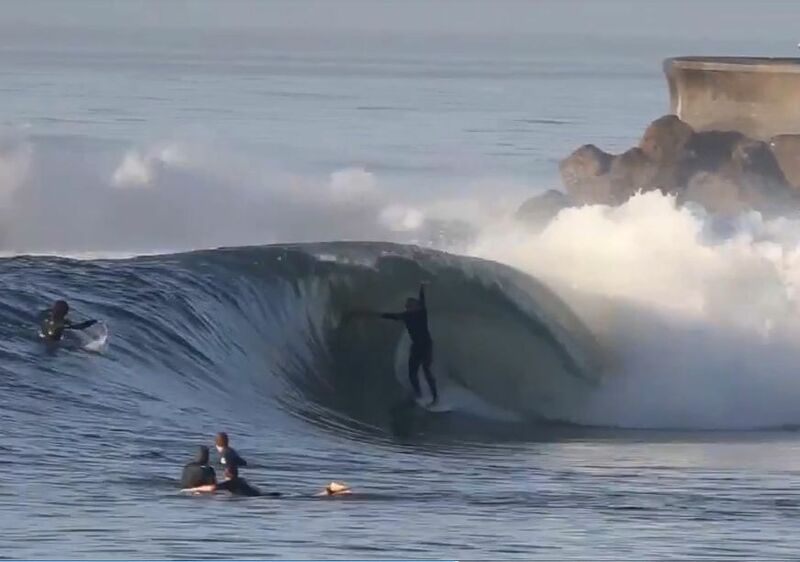 “Look at this shot of Sandbar yesterday,” my wife says to me this afternoon, and holds out her iPhone to reveal a video of an epic wave featured on some surfer magazine page on Facebook entitled, “An Endless Barrel at Sandspit.” Such are the times, cell phones and social media, and, well, blogs like this. Much hated by many, but that’s reality these days. “Wow. Oh man,” I reply, thoroughly envious of whomever it was that picked off the reeling grinder showing on the tiny screen. “You’re not pissed off you missed that are you?” she asks knowing me all too well. I had a brief moment to check the surf at that time. I knew it wouldn’t be as good as when the tide dropped, nowhere near as good, but I had to lay eyes on the scene as soon as I had a chance anyway. 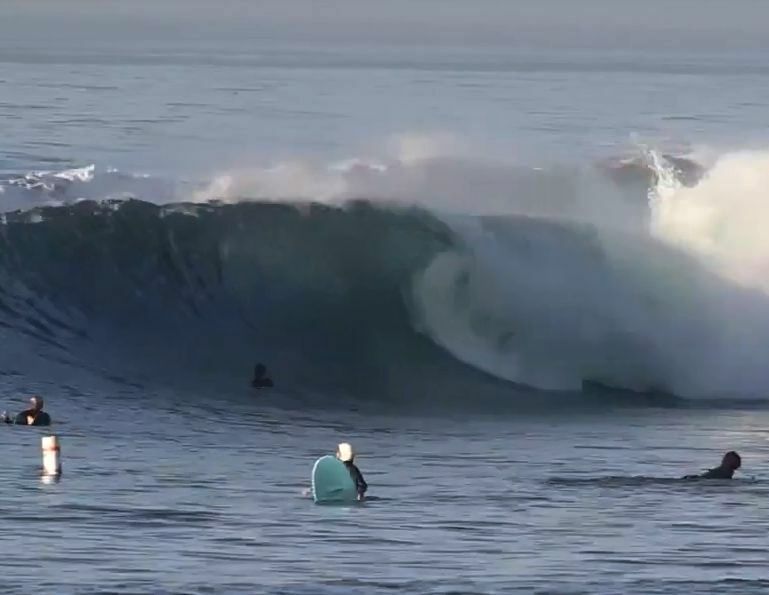 It was a rare swell event. 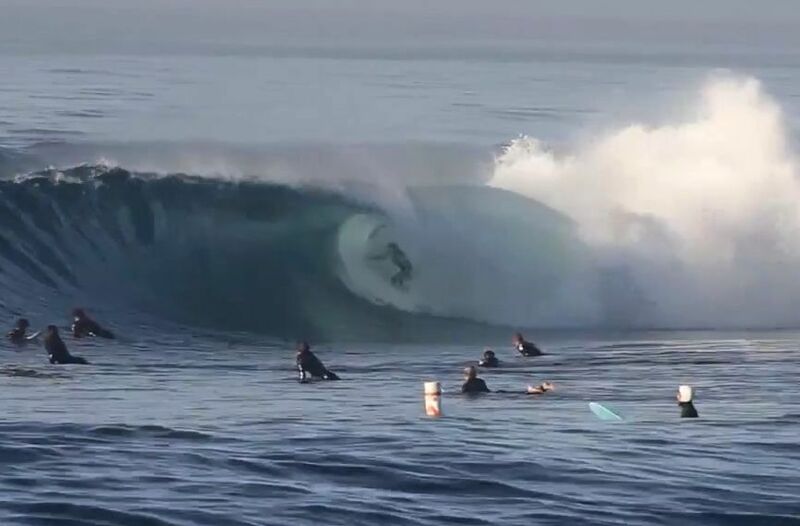 Late in the afternoon, that is the yesterday featured in the video my wife had shown me, not having felt like battling the mob I knew would show up at low tide Sandbar on an epic south swell, and not having wanted to try and elbow my way into waves amid the frenzy of wave-starved surfers, I had opted to go elsewhere. I certainly did not score anything remotely close to what’s seen in the video, but my afternoon was made sweet and memorable nonetheless with some clean and green long walls at a break that rarely works in summer. The last time I had surfed there in summer was in the mid-nineties, after wakening one morning at a friend’s house along Gaviota to the sound of meaty shorepound slamming the beach, and the air laden with ocean mist. It was a rare treat to surf there once again in summer. I see an old friend I grew up with at the beach today after having seen the video. He mentions that he saw Gabe, a mutual friend, at Sandbar on that glorious aforementioned yesterday. That he got one of the best waves he’s ever seen, saw it from the wharf across the harbor channel. He says he later saw it on video on the Web. Could it be? I wonder to myself. Naw. Couldn’t be. What are the odds? This entry was posted in Santa Barbara and tagged Hurricane Marie, Hurricanes, Inspiration, Nature, Ocean, Pacific Ocean, Sandbar, Santa Barbara, Sports, Surf, Surfing, Video. Bookmark the permalink. i scanned the headlines about the hurricane and the waves heading to california — and i immediately thought of you and wondered if you’d be posting about the surfing conditions! wow, that video captured the power of the waves.. i’m happy to be where the internet is fast enough to view it! Awww. Thanks for being such a loyal reader! I appreciate knowing you’re out there, and your frequent comments. i just finished reading/enjoying the chipmunk story… it deserves a much-larger audience! Doesn’t get much deeper than that. That was his first wave of the day. Unreal. Good job with the Gabe photo and glad too see the surf coverage as it is part of “our” truly local heritage. I’d like it a lot if you would give some time to the local fishing and hunting traditions as they are important part of our heritage especially for anybody who grew up here from day 1. What a ride! That guy must have been thrilled!